Federal regulations require MoDOT to submit a certification, upon completion and acceptance of a project, stating that the materials incorporated into the work substantially met the requirements of the contract. 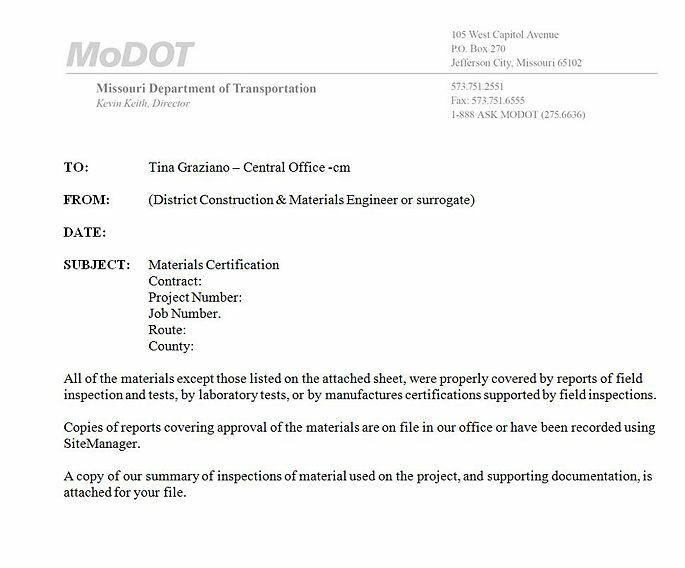 In addition, MoDOT is required to cite any shortages of material inspection or circumstances of acceptance of materials, which did not receive normal inspection. The Construction and Materials Division has been designated by the department to be the certifying agent. It is the intent of the specifications that all materials be properly inspected and reported for a specific project. However, it is realized that the total inspected quantity of a specific material might not always be attained. These instances should normally be rare. If shortages of inspected and reported quantities occur, the District Construction and Materials Engineer should determine if substantial compliance has been met. Substantial compliance indicates that there is a reasonable tolerance that could be applied. It has been determined that the reasonable tolerance would be a maximum of 10 percent, however, this tolerance should be used judicially, dependent upon the type and quantity of material represented. To comply with the requirements of the Federal Highway Administration and to ascertain that the materials have been properly inspected and reported, the procedures set forth in this article should be followed. Upon completion of a project, a statement attesting that all materials incorporated into the project were properly and adequately inspected is to be submitted to Central Office Construction and Materials. The statement shall include any exceptions as to material shortages or lack of inspection. A copy of the desired statement is shown as Figure 106.21.1 and is to be signed by the District Engineer or District Construction and Materials Engineer, or another individual as assigned by the District Construction and Materials Engineer. Central Office Construction and Materials is to be notified in writing of the individuals given this responsibility. The signature indicates that all data submitted has been reviewed by individuals reasonably familiar with the project and the data is correct and complete. This statement is to be accompanied by a Summary Packet. These documents should be completed and forwarded within four weeks for small projects or six weeks for large projects, from the date final quantities for the project have been established. A small contract is defined as having fewer than 40 bid items and an original bid amount of less than $1,000,000.00. If for some reason the summary cannot be completed and forwarded within this time frame, Central Office Construction and Materials should be notified. The Resident Engineer’s staff or the district final plans processor will enter a Key Date in SiteManager (SM) to indicate that data required for the summary is ready for use and that no additional changes are anticipated. This key date will start the four- or six-week period. If the quantity inspected and reported is less than the required quantity, notation is to be made on the summary cover letter or attached to the summary on a separate sheet describing the basis of acceptance of the material. If a material was used and not properly inspected, an explanation as to the basis of acceptance for use is to be shown on the summary or on an attached sheet. Any correspondence relative to the basis of acceptance should be attached to the summary. It is important that complete details be furnished as to the basis of acceptance. 2) Materials Summary, a standard Cognos report (Fig. 106.21.2). This report shows the bid quantity plus any change order quantities and multiplies it by the conversation factor to indicate the Represented Quantity as the amount that requires inspection. 4) Summary of Contract Asphalt Mix Designs, a standard Cognos report. This report takes the Mix ID and reports each component and its producer, listing them by material code. (Refer to Fig. 106.21.4.) The report only shows components for mixes reported to the contract. 5) Summary of Contract Concrete Mix Designs, a standard Cognos report. This report takes the PCC Mix ID information and reports each component, the producer supplier, and material information for a specific contract. (Refer to Fig. 106.21.5.) The report only shows components for mixes reported to the contract. 6) (Optional) Summary of Concrete Component Testing. This Cognos report is designed to summarize the testing of concrete components. The report calculates the tonnage and number of days each component was used. It does this by using sample record quantities and concrete mix design information. If this information is incorrectly entered or missing, the report will not function. Once the usage data is calculated, the report compares that data to the tests reported. There is no hard rule to what is acceptable on this report since differing concrete usages are subject to the varying inspection requirements. It is the district Construction and Materials Engineer’s responsibility to ensure that the output of this report is complete, reasonable, and reflects proper application of the contract specifications. Refer to Fig. 106.21.6 for an example. Attachment Page(s), any supporting information relative to shortages or exceptions to standard policy. Combination projects may be shown on the same summary providing each project is finaled within the four- or six-week period. A summary on one project should not be significantly delayed until another project is finished. When summary cover letters or statements are submitted in combination, any notations of shortages or exceptions should specify affected project(s). Status of 2AA sheets should be stated for individual projects when submitted in combination. The statement, summary of materials inspected packet and substantiating documents shall be saved electronically to the V: drive in the folder "Contract Information Archive/D#/RE code/Contract ID#/Materials Summary", for example: V:/Contract Information Archive/D06/6CD/040618-608/Materials Summary. The Key Date 080 "Materials Summary submitted to HQ" in SM shall be updated and an email shall be sent to Tina Graziano, Sr. Administrative Technician notifying her of the completion of the materials summary. Fig. 106.21.2 Example of "Summary of Materials for Contract"
Fig. 106.21.4 Example of "Summary of Contract Asphalt Mix Designs"
Fig. 106.21.5 Example of "Summary of Contract Concrete Mix Designs"
Fig. 106.21.6 Example of "Summary of Concrete Component Testing"
This page was last modified on 28 May 2015, at 14:00.